"I experimented with this and found it was well liked in my house. I have mulberries by the ton. Serve with ice cream." In a large bowl, mix berries with sugar and flour. Place mixture into bottom pie crust. Dot with butter and then cover with top pie crust. Crimp edges, cut slits in upper crust, and brush with milk. 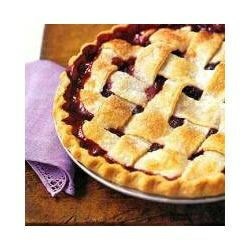 Let pie rest in refrigerator for 30 minutes. Bake pie in preheated oven for 15 minutes. Lower oven temperature to 350 degrees F (175 degrees C) and bake for an additional 30 minutes. Remove pie from oven and let sit on wire rack until cool.